Ansonia Clock Co. "Chippendale", ca about 1880. 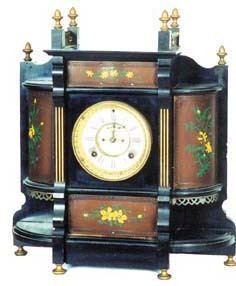 A fancy enameled wood mantle clock, not pictured in any of the major catalogs, although I have seen several of this model, most with good labels identifying them as" Chippendale, Ansonia Clock Co.". This clock has a nickel plated movement and strikes half hours and hours on a signed cathedral gong. It sits on 4brass feet, has 6 brass finials and 2 brass rails on top. Movement is 8 day and running, has a 2-piece porcelain dial with open escapement, and beveled glass. On the front are 4 leather panels with hand painted flowers, some highlighted. This large wood case is 19 1/2 inches high and 14 inches wide.